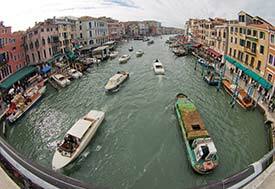 Old Venice meets New Venice in this photo of a package-delivery boat on the Grand Canal. 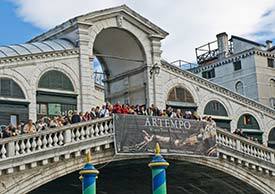 The Rialto Bridge's balustrades are packed with tourists and picture-takers on the Saturday of a holiday weekend. 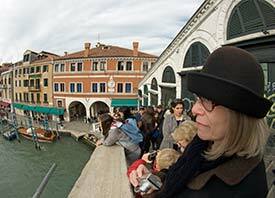 Don't let the crowds discourage you--if you're patient, you can easily grab a spot along the railing. 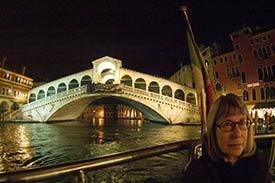 The views from either side of the Rialto Bridge are spectacular, with a constant stream of boats and barges traveling up and down the Grand Canal. 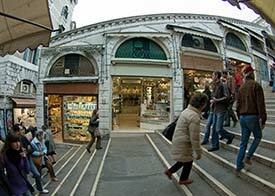 On the inside of the bridge, within the double row of stone arches that provide much of the bridge's structural strength, shopkeepers sell jewelry and souvenirs from stalls that have catered to vistors and locals since Venice's heyday as the most important trading center in Southern Europe.